E-commerce in Thailand is fast growth in 2-3 years ago. There are many players that involving in this industry but no resource and enough information for supporting the investors or who want to know about this. That’s a reason to make and collect all essential information for anyone interested. 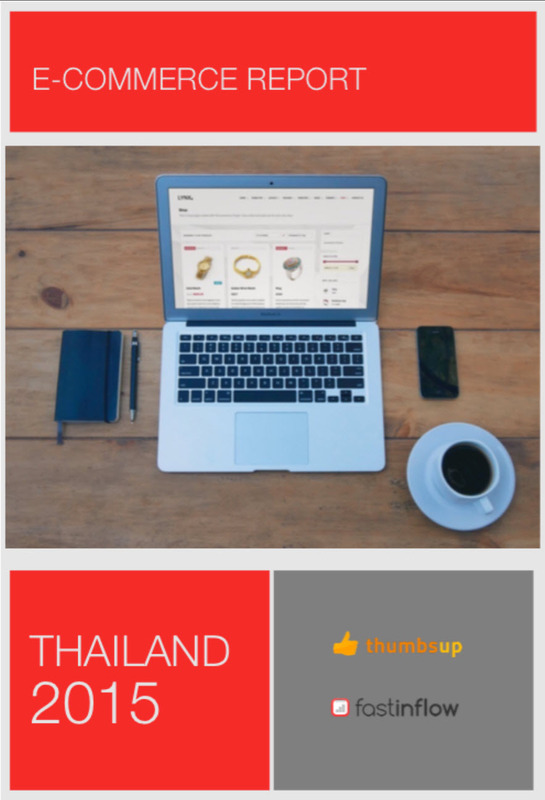 This report is a result of the collaboration between thumbsup and FastinFlow as both parties realized that the growth of the e-commerce in Thailand is really interesting and with such outstanding growth, many domestic and foreign players have jumped in which results in even greater changes in terms of consumers’ online behaviors in the past few years. However, the information that focuses on e-commerce in Thailand hasn’t been properly and thoroughly collected and analyzed, therefore we found that it was necessary to gather all the information and do the survey with the local consumers. We believe that the data will be highly useful for anyone who is interested in the e-commerce in Thailand. We will cover all angles starting from the overview of the e-commerce in Thailand, including the current situation, the ecosystem, the law and regulation, and all the way to consumer survey with over 600 samples. Then we will present the online shopping behaviour analysis which will explain what consumers think towards online shopping and e-commerce in the present day. Moreover, we will also present the outlook for the e-commerce industry which includes the perspectives from various key players, including corporate and private players and the mobile payment service providers. Whom is this report for? This report is carefully designed for those who are interested in the growth and the overall picture of the e-commerce industry in Thailand, especially the foreign investors and businesses who pay more attention to Thailand and surrounding markets. We believe that this report will be among the first to fully reveal and explain in detail about the fast growing e-commerce industry in Thailand. Besides, we strongly believe that this report will also become an important tool for businesses to make crucial decisions towards investing in e-commerce in this market. – Over 88% of Thai consumers expect to see the improvement of warranty from product and service. – 75% of Thai shopaholic in this study is transferring the money by bank to buy online.